Russ Jones remembers his first triathlon like it was yesterday. Of course, it helps when you still have the trophy—believed to be the first ever awarded in the sport—to keep your memory sharp. The year was 1975 and the event was the second edition of the Mission Bay Triathlon. For history buffs, the previous year's race—more of a handshake workout than an organized event—is credited as being the first triathlon in the U.S. and maybe the world. But it wasn't a triathlon like we've come to know the sport, instead a unique reverse run-bike-swim event that was common of early races in the 1970s. Those events were organized by the San Diego Track Club, so it's perhaps no surprise that the events favored runners. The race started with a 5-mile run, giving the faster runners a big advantage heading into the 5-mile bike. 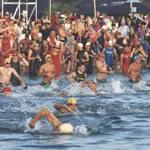 From there, racers swam about 200 yards, got out of the water and ran 200 yards along the shore before finishing the race with another 200-yard swim leg. Jones recalls competing in a pair of Tiger running shoes, gym shorts and a T-shirt. He borrowed his track coach's bike, a "$49 K-Mart 10-speed" and, with almost no training outside of running, he showed up at the starting line. "That's how it was back in those days," says Jones, 56, who lives in San Juan Capistrano, California. "It was mostly a bunch of runners. And honestly, I had a huge advantage because I was a good runner. If you were a good cyclist, you weren't going to pick up any time on a 5-mile bike ride or during a couple of 200 yard swim legs. But it was sponsored by a track club, so maybe it was like, 'Hey, let's favor the runners.'" For Jones, it was the start of a long career in multisport racing. He won the Mission Bay race again the next year—beating Scott Tinley in one of his first races—and has been racing ever since. "I knew I could run. I knew I could swim, and I figured anyone could ride a bike," Jones says, echoing a familiar sentiment of the time. "And that's how I got started." For much of his working career, Jones was a U.S. Postal letter carrier who was known as "the running mailman" because he would run his 10-mile route around Camden, New Jersey. Back then, he was also a top regional triathlete and duathlete. In 1981, he won the first EagleMan Triathlon in Cambridge, Maryland, an event that began as a 2-mile swim, 20-mile run and 20-mile bike. He also won the Brooklyn Biathlon and was a five-time winner of the Big Apple Triathlon Series. Jones is one of the celebrated pioneers of multisport racing, with more than 100 triathlon/duathlon victories to his credit. He never moved up to the Ironman distance—mostly because he didn't think his body could handle the massive volume of training—but racked up numerous national championships at a variety of distances and was an eight-time age-group winner of the competitive Pacific Coast Triathlon. Although he retired from the postal service last year, he's still heavily involved with the sport he remains so passionate about. He was ranked tops in the USA Triathlon 50 to 54 age group three years ago, stays fit enough to race several times every summer and recently started a sprint triathlon coaching business called TriLessIsMore that focuses on extending an athlete's longevity. Jones was a gifted runner as a kid who won a New Jersey high school 2-mile championship and went to United States International University on a track scholarship. He would eventually run a 2:18 marathon and qualify for the 1980 U.S. Olympic trials. While he might have eventually gravitated to multisport racing later, he admits he was fortunate to be in the right place at the right time in the mid-1970s at the genesis of triathlon. "Back then, I was mostly a runner, and it was lucky that I just happened to be in San Diego where triathlons were getting started," Jones says. "There was a buzz happening then that wasn't happening anywhere else in the world. And look where the sport has gone from those days. It's pretty cool to have been a part of it." Start your journey: Sign up for a triathlon. This article was originally published in USA Triathlon Life magazine. USA Triathlon is proud to serve as the national governing body for triathlon—the fastest growing sport in the world—as well as duathlon, aquathlon and winter triathlon in the United States. Visit usatriathlon.org.